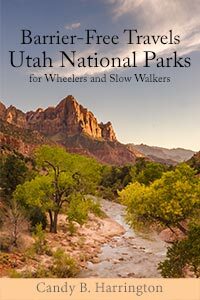 I was thrilled to hear that Barrier-Free Travel; Utah National Parks for Wheelers and Slow Walkers was named a finalist in this years INDIES book awards. Previously named the Ben Franklin Awards, this prestigious prize is presented by Foreward Reviews, an independent media company. And I was also equally thrilled when 22 Accessible Road Trips; Driving Vacations for Wheelers and Slow Walkers was named a winner in 2013. In any case, it’s an honor to be chosen as a finalist from over 2,200 entries. The final judging will be conducted by an expert panel of librarians and booksellers, and the winners will be announced at the 2017 American Library Association Annual Conference in Chicago on June 24, 2017. Of course I’m happy for myself, but I’m even happier that accessible travel is getting more mainstream recognition. Onward and upward! This entry was posted in Resources and tagged award, Foreward, guidebbok, INDIES, Utah by Candy B. Harrington. Bookmark the permalink.